yelworC, a German project launched by Peter Devlin and Dominik van Reich in the late 80s, has been a source of inspiration for many bands and is almost historical on the electro-industrial music scene. The name spelled backwards is Crowley, as in Aleister Crowley, who was an influential advocator of the practice of magick during his lifetime and still has followers to this day. One can imagine the novel peculiarity of the music yelworC puts out based on that alone. The lyrics pay homage to the Dark Arts, horror genre movies, corruption, religion and death to name a few themes. The sound of the music itself is gloomily satisfying with lots of dark synths, deep basses, twisted vocals, occasional spoken dialogue, dance-inspiring beats, and strange, indeterminable noises. yelworC began their musical expedition in 1988, and between that year and 1991 they put out 8 demo tapes before getting signed to the German label Celtic Circle. Under that label they put out three albums, 1992's Brainstorming, 1993's Blood in Face, and 1995's compilation CD of rare tracks, simply called Collection, 1988-1994. Even though those albums were put out with moderate success and promise, the duo split up and Devlin remained as yelworC while Reich formed amgoD (Dogma backwards). yelworC became an extremely rare find and was thought a defunct and lost act for many years. 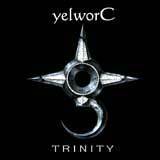 After their decade-long absence, yelworC returned to the forefront of electronic music and recaptured its place in the clubs with the concept album Trinity. As the start of a trilogy in which yelworC demonstrates unbroken vitality and continues to set new standards in the dark-electro-scene, Devlin again proved his innovative potential. With the album Icolation, yelworC continues the themes explored in his previous album, Trinity. Drawing influence from Dantes Inferno, Icolation takes the listener on a journey of the damned, from darkest hell straight to an apocalyptic purgatory. The music is as hard, twisted and complex as before - a synthesis of strong, vital rhythms and darkest melodic compositions. Darker than dark, harder than hard - but always featuring that surprising and patented twisted YelworC sound. The master of evil electronics has returned, and has brought the very sounds of Hell with him.